Your teeth could always use an extra bit of protection, right? Well, that’s exactly what dental sealants and fluoride treatments provide. 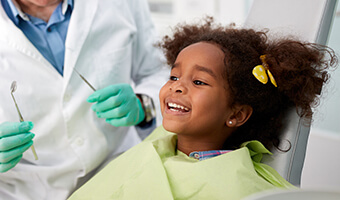 These quick and easy services are just two more ways we can help you fight/prevent tooth decay and cavities. A dental sealant is a clear, thin layer of a composite resin that is applied to the teeth to protect them from plaque and bacteria. Most of the time, they only need to be applied to the back teeth because they have so many small and hard to reach surfaces. It’s an ideal treatment for both children who are still learning to brush and adults who are prone to developing cavities. As part of your regular checkup, you’ll also receive a fluoride treatment. Fluoride is a naturally occurring mineral, and when it is ingested (whether in food or water), it actually replenishes the minerals in your teeth that are stripped away by plaque. This is why you’ll typically see it in toothpastes and public water sources. You’ll simply swish a highly-concentrated fluoride solution in your mouth for a few minutes, and that’s it! Both of these treatments are fantastic for protecting and strengthening your teeth. If you have any questions, be sure to ask them, and contact our office today.